When the Beaverton School Board had to trim $7 million from the district budget, Forecast5 Analytics gave members the tools they needed to weigh district programs, according to Board Chair Becky Tymchuk. Forecast5, which offers data analysis applications, began offering services in Oregon last year, and Beaverton was the first school district to sign up. Forecast5 has been popular with pilot districts, and OSBA is supporting access for more districts. The 6-year-old company mines data schools provide to the state and puts the information in applications and infographics for easier analysis. Districts can identify trends, look for inefficiencies and compare their data against others. Tymchuk said the budget committee looked at all Beaverton’s programs with factors such as cost per student, achievement rate and staff allocations and compared Beaverton with similar districts. Board members looked at return on investment and identified programs to cut, Tymchuk said. Forecast5 works with government agencies in 27 states, and more than a dozen Oregon districts have signed up in the past year. 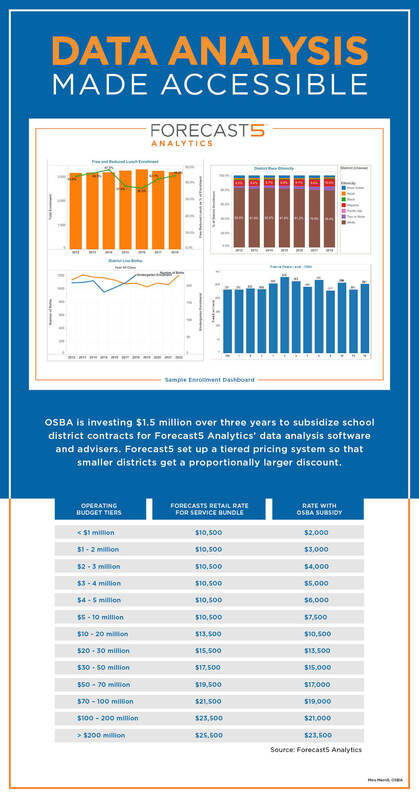 OSBA announced in June that it was investing $1.5 million over three years to subsidize Forecast5 for all Oregon school districts. Jessica Jones, Beaverton School District budget analyst, said Forecast5 is a powerful tool that allows the district to handle all its information in one place without time-consuming data entry. “Forecast5 pops it right out there in a way that is easy to read,” Jones said. Districts can also deliver their data to Forecast5 before state deadlines and get real-time results to guide budget and academic performance decisions potentially months before statewide data releases. Schools can provide additional customized data to answer specific questions. “The data set gets richer as more schools get on board,” said Jeff Carew, Forecast5 Analytics managing director. OSBA is subsidizing Forecast5 in Oregon so that all districts can have useful access to information they have been sending to ODE for years, said OSBA Executive Director Jim Green. “OSBA’s board saw it as an opportunity to use our resources to help as many districts as possible with a direct service,” Green said. Smaller districts will get a larger proportional discount so that Forecast5 is more affordable, Green said. Many smaller districts don’t have personnel equipped to make best use of the information, but Forecast5’s services include advisers and professional development. OSBA’s investment also allows all Oregon school districts free access until Dec. 31 to 5Sight, one of Forecast5’s applications. OSBA is the only state association helping its members like this, Carew said. Forecast5 sent sign-up information to district business officials last week. Districts that didn’t get an email or need more information can go to Forecast5’s Oregon page or contact Relationship Manager Adam Saleem at 630-955-7557. Tigard-Tualatin School District used Forecast5 to adjust its maintenance budget, according to Elizabeth Michels, district controller. After custodians and maintenance staff told the administration that the district was not budgeting enough for everything from cleaning supplies to building upkeep, Forecast5 showed that Tigard-Tualatin was spending below the median for a district its size. School Board Chair Jill Zurschmeide said she could see the results in graphics and information added to board reports. Zurschmeide said she is hoping OSBA’s involvement encourages more districts to become involved so that Tigard-Tualatin can make better comparisons with peer districts. Angie Peterman, Oregon Association of School Business Officials executive director, said she has been working with Forecast5 for years to bring its services to Oregon. She said one of the sticking points had been that the company’s pricing system put too much burden on smaller district budgets, but OSBA’s investment allows for more pricing tiers. Oregon now has the most pricing tiers of Forecast5 states, according to Carew. OASBO is Forecast5’s Oregon corporate partner, facilitating trainings and negotiations. Philomath School District Business Manager Bill Mancuso said the district had the application installed in the spring. He said Forecast5 makes it easier to see data than the Excel spreadsheet he had been using. Forecast5 reduces the potential for data entry mistakes and has more historical information. “It lets us give our constituents more information on a quicker time frame,” he said. He also appreciates the infographics that provide a cleaner presentation with less staff time. Mancuso said he is primarily focused on forecasting right now and the application allows him to easily create scenarios with different numbers. “It gives us the ability to play around a bit,” he said.